In today’s post, after a short introduction, we are going to analyze a real case from automation sector dealing with blistering and air trapping problems that were solved through the use of simulation software. In the process of zinc alloy die casting the element that most influences the final casting is the feeder duct, which leads the alloy into the die. A correct feeding of the die has crucial importance for quality, strength and finish of the product, and can also prolong mold life span. 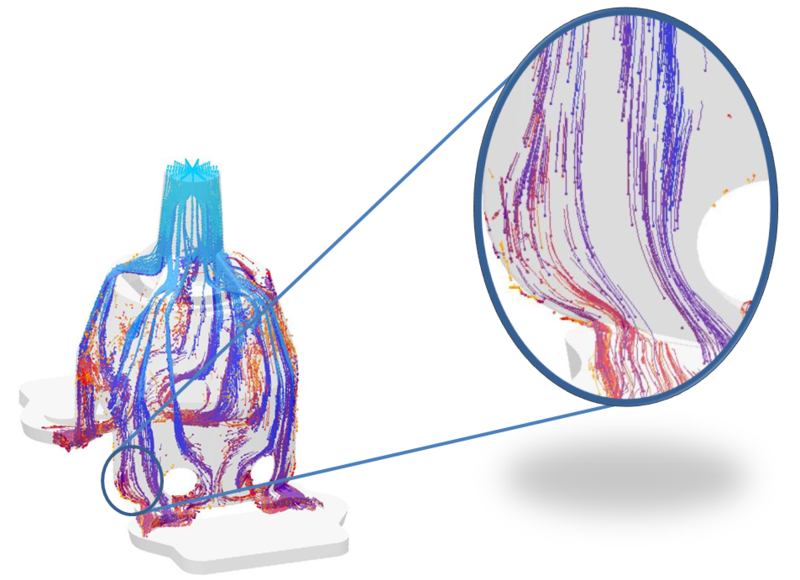 The simulation of feeding, filling and solidification phases offers a real advantage: it helps to predict possible defects caused by non-uniform liquid flow, high temperature gradient, local increase in velocity, and other issues. With simulation software it is possible to optimize the entire production with positive effect on duration of die life and on the final product in terms of aesthetics and efficiency. 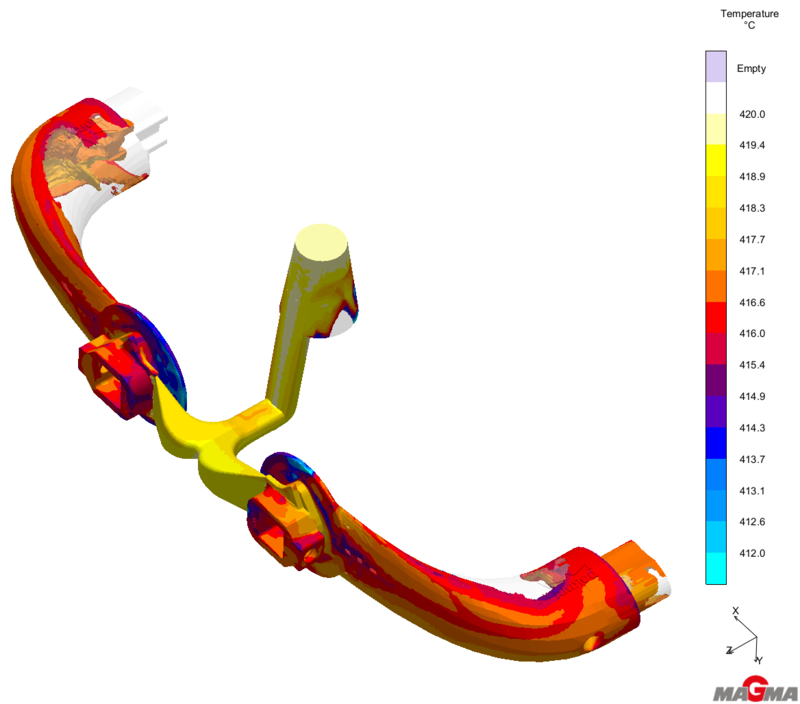 These simulations can be run through the use of specific software, such as Magmasoft. Magmasoft is an innovative software package specifically developed for simulation for HPDC. It allows simulating the die feed and the casting solidification, calculating alloy flow, alloy temperature and the possible presence of gases or porosity in the finished product. Thanks to the simulation it is possible to identify the best configuration for the feeders and to achieve the best results in terms of precision and reliability, reduce risks to a minimum and save time and resources. In this series, we are going to analyze case studies in which simulation analysis has contributed to improve current production runs and avoid engineering mistakes that would have affected the finished product by generating waste of material, time and resources. Now we are going to present the first case study, related to scrap reduction for a product used in the sector of energy management and automation. This case study is about a support for an emergency switch. Due to its function, the product is in sight but high esthetical quality is not required. However, the product required a painting process that brought out surface defects. 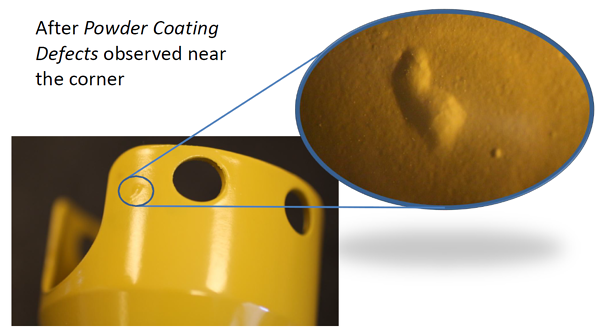 The die of this product has been in use for several years and has always generated 5% scrap due to the formation of bubbles during the painting process. The origin of this phenomenon is the presence of air in the alloy which is forced out of the product by the high temperatures that are reached during the painting process and stays trapped between product and paint layer. This kind of defect is known as blistering. In this case the simulation focuses on avoiding bubbles in the post-production phase. The objective of the simulation was to reduce the quantity of scrapped parts caused by entrapped air. We examined the behavior of the flow during the filling phase to ascertain the causes of this phenomenon. Subsequently, alternative ways of feeding were studied. The analysis shows reflux and air encapsulation areas in proximity of the edges, where bubbles are later spotted. 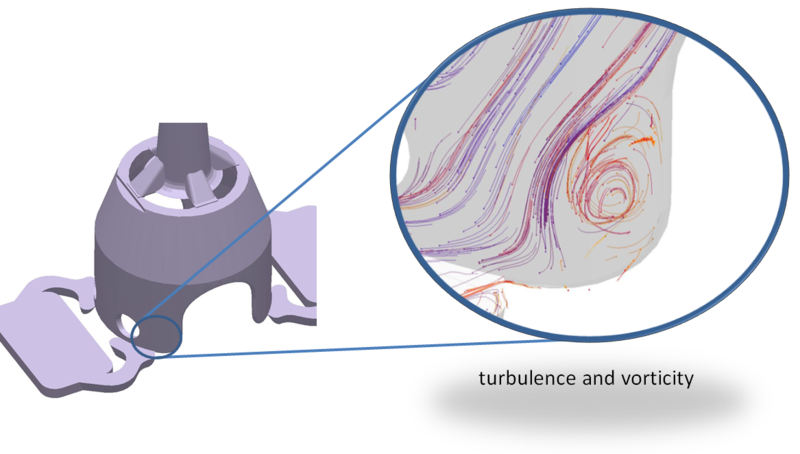 This turbulence is caused by the speed of the flow and by the geometrical characteristics of the part. Once the cause of the problem was identified, it was possible to search for a solution that could reduce the speed of the flow. The solution that is depicted in the image represents an alternative feeding, with the feeder ducts rotated by 45° around the axis of the product. The results of the modification are shows consecutively. 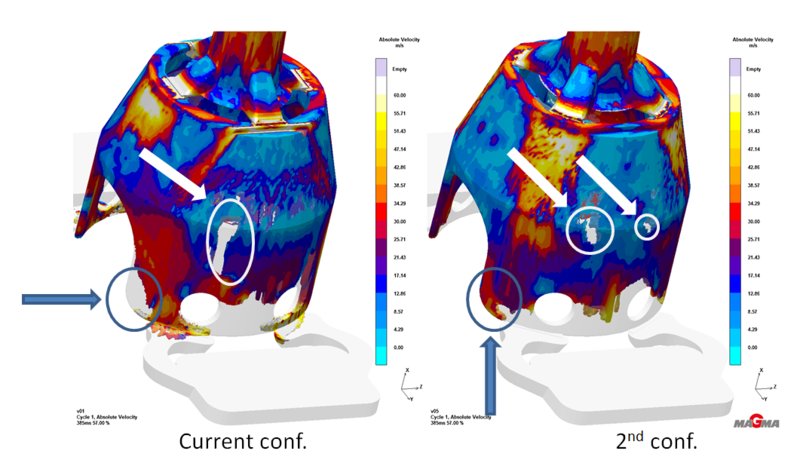 Through the use of a simulation, the reflux area has been fully eliminated and the filling flow results more uniform. After the simulation, the die has been modified with results confirming the validity of the study: the quantity of rejects caused by bubbles was reduced by approximately 95%. In conclusion, thanks to the use of simulation for HPDC it was possible to clearly identify the problematic areas where air trappings formed. 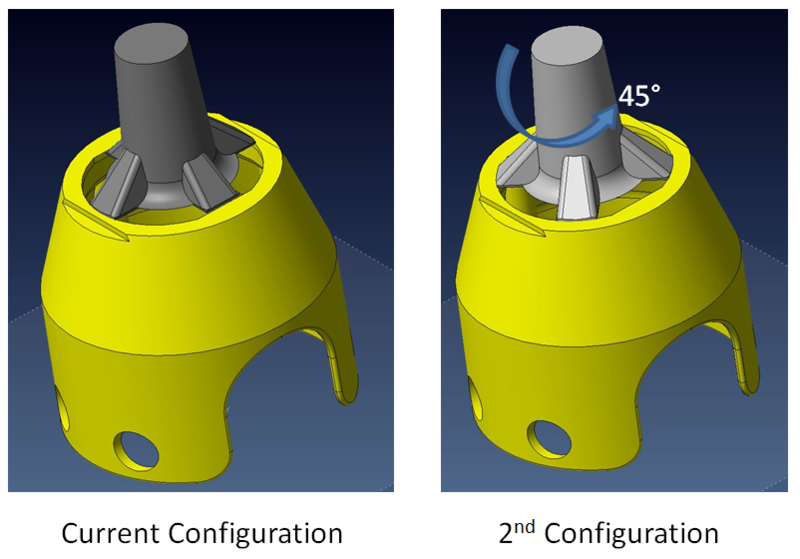 The rotation of feeder ducts allowed the speed of the flaw to be regulated without modifying the shape of the component, preventing reflux in the previously identified areas. After the modification of the feeding system, the scrap rate caused by blisters was significantly reduced. This is just one of the many examples in which the use of simulation for HPDC can help improving production. To learn more about the use of simulation and the advantages it can bring, subscribe to our blog.